In the ongoing battle between traveling surfers and major airline carriers, there’s been another flurry of aggression. The latest comes from Basque surfer Natxo González and Iberia Airlines. González was en route to Chile for a massive swell, toting a quiver including a 10’4”, 9’6”, and 7’4” to surf a secret spot with Kohl Christensen. The same swell is projected to make its way north and light up spots from Central America, to Mexico, and to the US West Coast. But after arriving in Chile, González opened his boardbag and found destruction; the three boards were snapped with near surgical precision. As we mentioned above, this is just the latest skirmish in the feud between surfers and airlines. 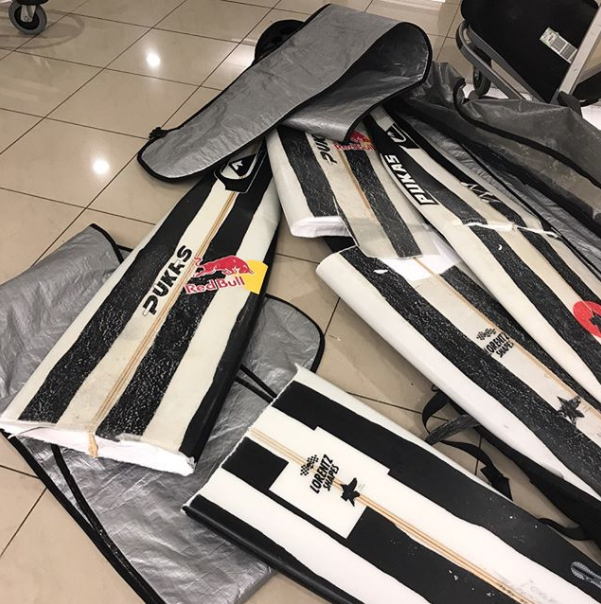 Earlier this year, Alex Gray’s quiver was similarly severed by American Airlines (he was refunded later). And Bob Hurley and Kelly Slater waged war against Hawaiian Airlines’ strict policy for transporting surfboards. More recently, however, Hawaiian and Alaska adjusted their policies in favor of traveling surfers. But those are only minor victories; the struggle continues, as seen with Natxo’s recent experience. And there will undoubtedly be more battles fought before the war is won. Click to read the full story by Surfline here.